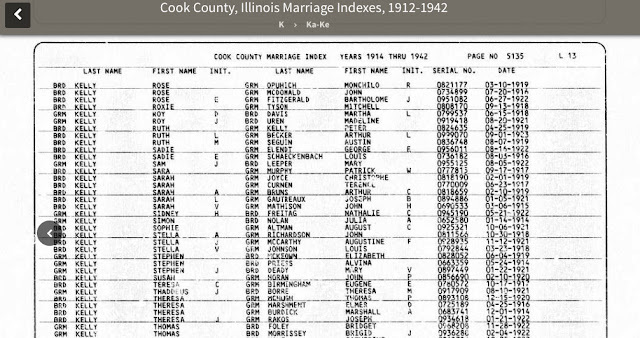 Spent some time looking at the 1890/91 Cook County birth register yesterday. The names are in A-Z order for each month (someone must have had all of the certificates before making the entries or recopied them? ), but I noticed that there are some miscellaneous names at the end of each month--something important to keep in mind while searching. The Chicago Death Index (aka Burial Permit Index) lists some entries for stillbirths (SB) before 1916 but where are the certificates? I did a bit of detective work today and I now believe that the early Cook County death certificate films at IRAD are exactly the same as the ones available through the Family History Library. The IRAD film that I looked at had the FHL film number on the box and the certificate numbers on the reel (and the gaps) matched those on the FHL film perfectly. Went down to IRAD at Northeastern Illinois University on the advice of a fellow researcher and had a wonderful time looking at the Undertaker's Reports on Burials for Jan-Jul of 1863. They are similar to the death registers I've seen--name, death date, age, cause of death, birthplace, cemetery name (if I remember correctly)--and I'm told that IRAD has indexed them and that the index will eventually be made available. When I first started doing lookups, I had to look at up to four films to find some of the death certificates in the teens--until I figured out the pattern and the exceptions to the pattern. Now I need to do the same thing with the birth certificate films. Apparently, for some years (in the teens? ), the December birth certificates for one year were filed with the certificates from the beginning of the following year. What this seems to do is push the months off the expected pattern. For example, with three repeats of certificate numbers, I'd expect them to be Jan-Apr, May-Aug, Sep-Dec, but it looks like sometimes April may actually be in the second group: Dec-Mar, Apr-Jul, Aug-Nov? Time for a bit of new sleuthing. Spent some time looking for John Oates/Oades in the 1870 census this week. I got side-tracked by a John Oats married to a woman of the right name with a son Fergus in the household, wrong age, and then stumbled on the right family searching for people named John, born in England, in Cook County. If I hadn't known that they had lived in Northfield in 1880, I might have skipped over it. They don't generally appear interfiled with the Chicago certificates, but I was lucky enough to find one that way this week. Interesting thing was that the certificate actually seemed to be a Chicago form which might explain why it was filed where it was.